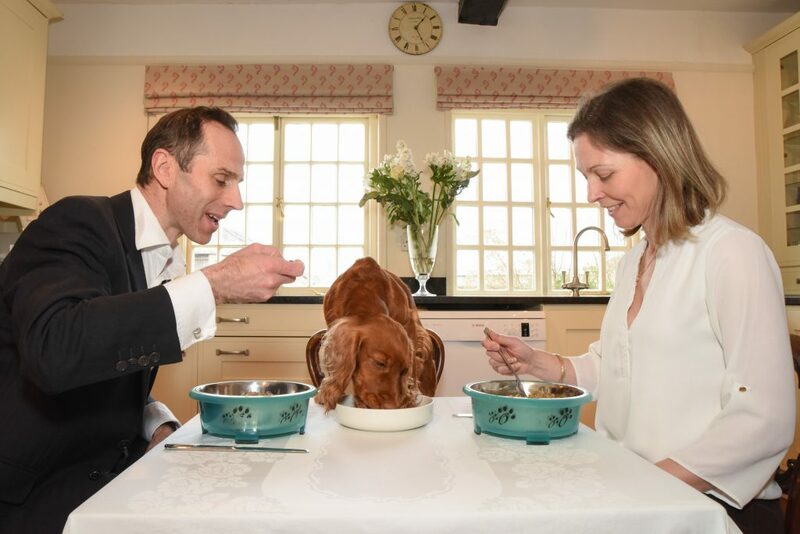 This married couple set up a business selling fine dining dishes for dogs – and are so convinced of the quality of the food, they test it THEMSELVES. 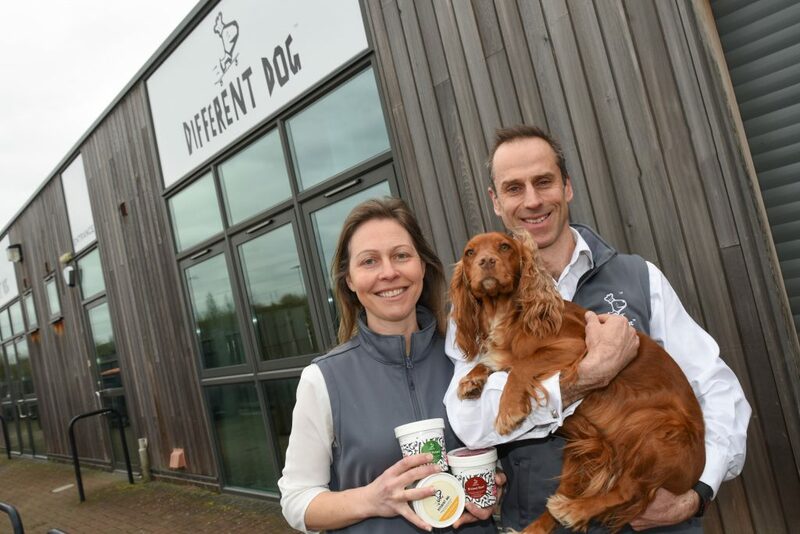 Husband and wife duo Alex and Charlie Thurstan, from Shrewsbury, Shrops, launched company Different Dog in 2016 after noticing the poor quality of ingredients in the food on offer for their own four-legged companion. 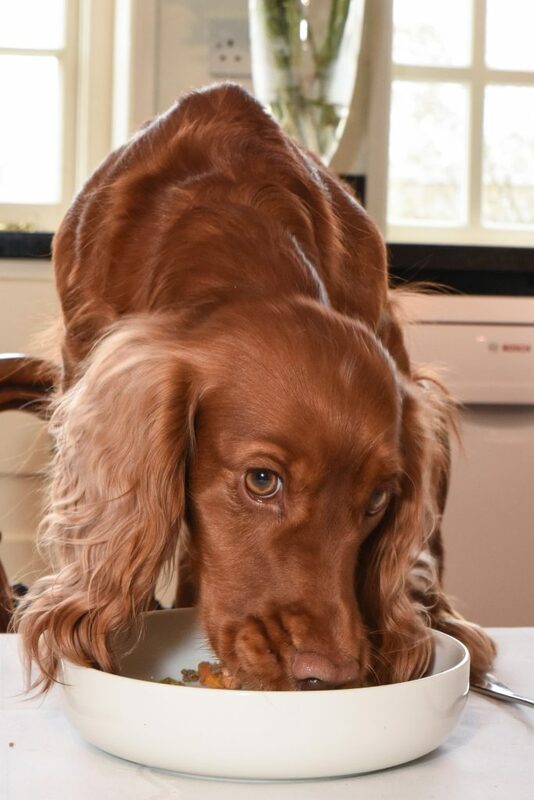 Alex, 44, initially started creating meals for the couple’s cocker spaniel Crumble from her own kitchen using the same high quality, fresh and nutritious ingredients she fed her children, Tom, 13, Johnnie, 11 and Ben, eight. 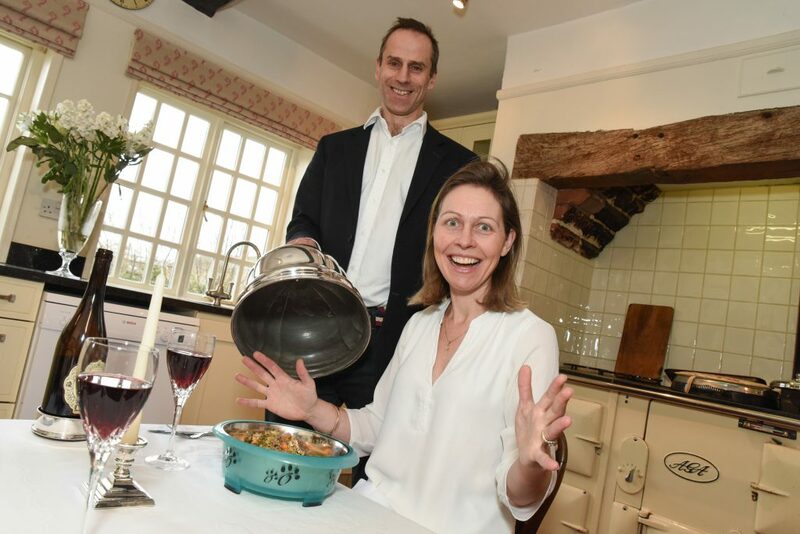 The pair then began cooking food for friends’ dogs before quitting their jobs to set up their business, which now employs professional restaurant chefs to prepare pooches family favourites such as lamb hotpot, braised beef, chicken casserole and turkey fricassee. And Alex, 44, and Charlie even insist the quality of the dog food is so good they will happily test taste it themselves. Charlie, who previously worked as head of food at Pets at Home, said: “We set up different dog three years ago because we wanted to change dogs’ lives by giving them ‘real food’. “It came from a deep-seated conviction dogs aren’t being fed in a particularly healthy way, and their diet is not giving them everything they need. “If you go back 50 to 100 years, dogs were eating a lot more healthily. “More is known about health and nutrition now, yet the processed dog food business has never changed. 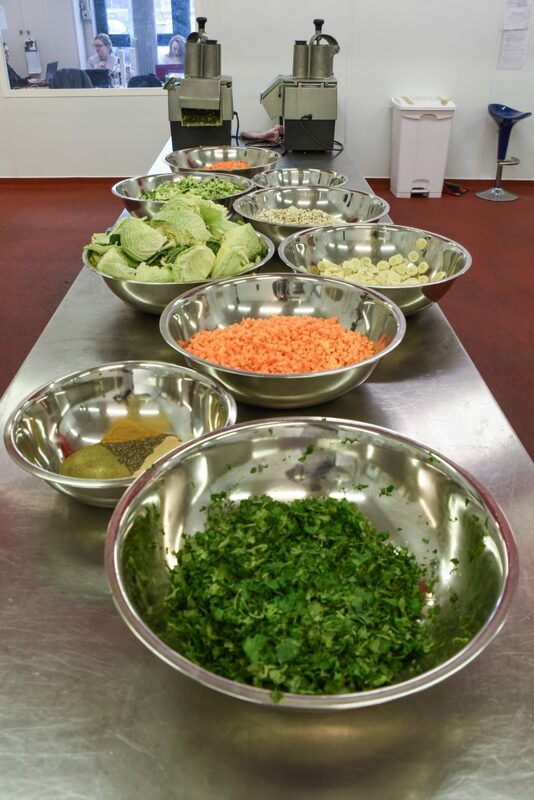 “The team we employ come from the human food industry, and our head chef has over 13 years’ experience in restaurants. The couple said they source all ingredients for their products – which retail at between £2.50 to £5.49 per meal – from a local butcher and greengrocer fresh. And while some dishes have offal ingredients people wouldn’t like, such as heart, none of the ingredients are harmful to humans. Alex, a former freelance business consultant, added: “As a mum I always make sure I give my children fresh fruit and vegetables, so they have a balanced diet. “But dogs aren’t getting this just with processed food, and I felt dogs deserved better. “We use the same suppliers as restaurants in our local area, so we are very confident and happy to try food ourselves. “And we feed our family with the same food we serve in the meals we prepare for Crumble. After coming up with the idea for Different Dog, Charlie and Alex hired a vet and a nutritionist and spent 18 months testing 150 version of different recipes and processes. The couple, who have been married for 18 years and together for 20, then officially launched their business in late January 2017 and began trading in November 2017. Their customers can sign up to a subscription service and there are natural treats and gift hampers available. The food is also available to buy from around 40 shops around the country. The couple introduce a new recipe to their menu every month to provide plenty of variety and make seasonal specials such as their beef and pumpkin for Halloween and a Christmas offering which features turkey, cranberry, sage, red cabbage and parsnips. Everything in their meals is safe for dogs to eat and they don’t include ingredients like raisins, onions or chocolate which may be toxic. They said response to their food from both pets and their human companions alike has been incredibly positive, with many owners claiming the food has changed their dogs’ lives. Charlie said: “In my previous job, I would meet suppliers and tour factories where processed food was being made. “I saw what went into it and the processes used to cook it – it’s cooked at incredibly high temperatures and pressures to sterilise the food and give it a two-year shelf life. “Then they spray it with things to make it tasty so the dog will want to eat it. “I was pretty horrified by all of this and it really didn’t feel like the right way to feed a dog – we just felt dogs deserved much better. 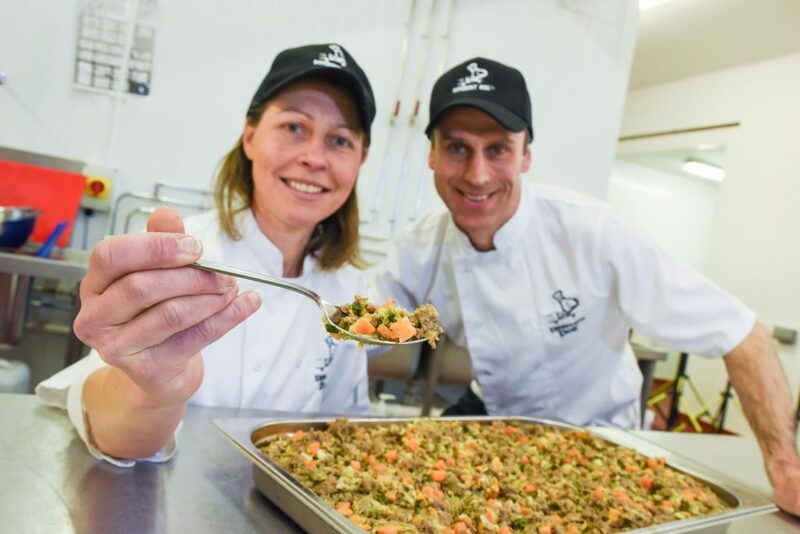 “Now, every new recipe we make is sent off to the lab so we can make sure the level of key nutrients is right before it goes on sale – it’s a complete and balanced food. Alex added: “We’ve had customers trying years of different diets with their dogs and nothing has worked until they tried our food. A women and her service dog who both use prosthetic legs have the most amazing bond!